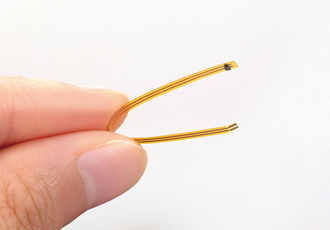 Murata has announced that it will soon commence production of a range of surface-mounted NTC (Negative Temperature Coefficient) sensors, packaged on a Flexible Printed Circuit (FPC) film. Easily routed inside complex designs and tight spaces, the devices feature an FPC thickness of approximately 100µm. The sensors’ low heat capacity ensure excellent thermal responsiveness. The sensors measure 50.00x3.17x0.55mm, making them suitable for determining the housing temperature of smartphones and tablets and for use in wearable products which monitor body surface temperature, such as fitness bands and sports performance monitors. The FTNT55XH103FA1A050 sensor can measure temperatures in the range of -40 to +125°C. At 25°C, it boasts an accuracy of ±0.4°C and resistance of 10kΩ ±1%. With smartphones and tablets becoming increasingly compact, with more sophisticated functions, the thermal design needs to be monitored in space-constrained designs. Additionally, the IoT trend of wearable products is gaining popularity, and the low-profile film temperature sensors' size and sensitivity suits use in these applications.